When I double click on an entry in my Error List or Find Results list in VS2010, it docks the newly opened source code file not in the large window where all my other source files go, but in the small narrow window at the bottom along with the error list etc. How can I get it to put it up with the others by default? I got things back to normal by using the Window | Reset Window Layout menu option. I noticed that now the tabs for "Error List" "Output" "Pending Changes" etc were now at the bottom of their docked window rather than the top. I think I somehow or other must have created a second code window area and docked my error list window etc into that. I too had this problem and now found the cause: if you move the bottom window pane a visual guide is shown on which you can dock them to various places. For the bottom two visual options are shown - one where the pane will be part of the upper pane and one were it will be placed below the upper pane. The second choice gives a proper behavior wereas the first one gives you the tab titles at the top and doesn't work. I think this is very annoying because it happens from time to time that I accidentally drag the pane. (I'm using a tablet) Probably this dragging is the cause for the trouble. I was having the same issue but, for a number of reasons, didnt want to reset all my settings. 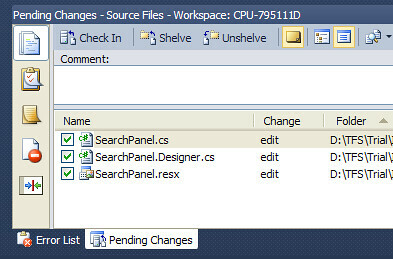 I draged all the open windows from the bottom panel area so they were floating, closed the find results window, redocked the error and output windows, then did a search (find in files) and the new floating window popped up, I then docked this to the same area that errors and output were in and when I double clicked on a file in the results window it opened in the right place. I couldn't find the Window -> Reset Window Layout option. The above answers helped me understand, the problem was with me having moved around my windows. What finally helped me was the little symbols on the top right corner of the find results window. Instead of the usual 'Inverted triangle'+'Pushpin'+'x' symbols, what I saw was just the Inverted Triangle, which meant I docked the find results window in the main file docking area. So, when I moved it to the bottom docking area in Visual studio, it worked for me. Not the answer you're looking for? 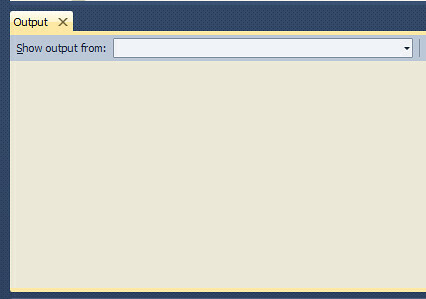 Browse other questions tagged visual-studio-2010 visual-studio visual-studio-2012 or ask your own question.